Hansel McDonald was first introduced in Zoolander as Derek’s runway nemesis. He was the rising star of the fashion industry at Derek’s lowest time. Hansel was also the model who won against Derek during the Walk Off. As a fashion model, you know that Hansel would prefer high-fashion, out of the ordinary clothing. In this outfit, he is wearing a purple button-down shirt, a brown fringed jacket, silver pants, and a pair of black boots. Here’s everything you need to look like Hansel from Zoolander! 1 Purple Button-Down Shirt Hansel prefers an eye-catching purple button-down as his base shirt. 2 Silver Pants He matches his purple shirt with a cool pair of futuristic silver pants. 3 Brown Fringe Jacket Hansel prefers a brown fringed jacket as a fashion statement piece. 4 Black Boots Hansel finished his ultra-vogue look with a pair of black boots. 5 Teal Bead Necklace Hansel accessorizes with a simple teal bead necklace. 6 Blonde Shoulder-Length Wig If you don’t have Owen Wilson’s naturally good-looking hair, wear a blonde wig. 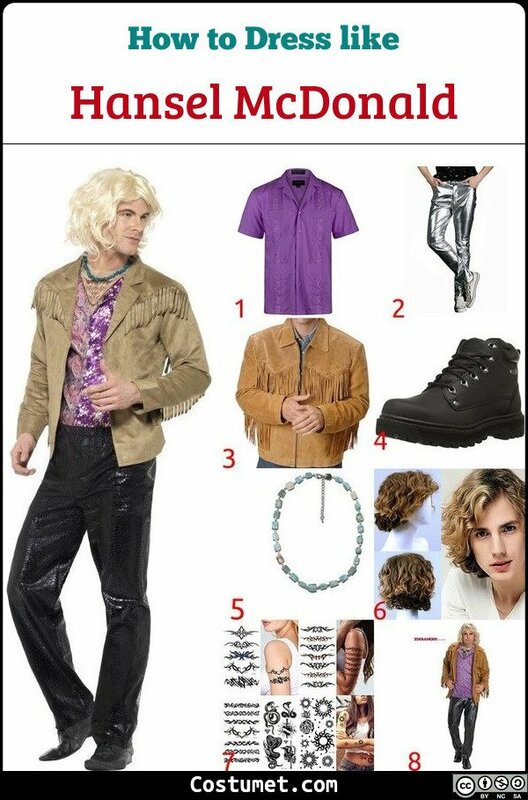 8 Hansel Zoolander Costume Set You don’t need to DIY your outfit if you get this costume set. Hansel McDonald was portrayed by Owen Wilson. Wilson is also known for his other roles like Eli Cash (The Royal Tenenbaums) and Lightning McQueen (Cars).